It’s no secret that California is in the midst of one of its most severe droughts in history. Rainfall totals are reaching historic lows and reservoirs across the state are seeing dangerously low levels. With extreme droughts come government regulations and programs aimed at lowering water consumption by the general public. This includes voluntary and mandatory water use restrictions. Along with use restrictions, some water districts and municipalities offer rebate programs to provide an incentive for customers to limit water usage by switching to high-efficiency, water smart appliances or irrigation systems. 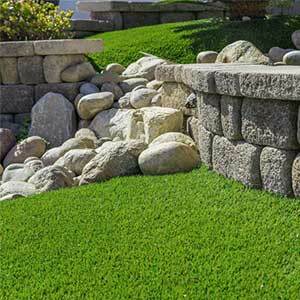 One rebate program being offered by many municipalities in Southern California can help with your long-desired outdoor home improvement project: The Turf Removal Rebate Program. Homeowners may receive up to $3.00 per square foot of water-intensive grass turf removed and replaced by water conserving landscaping options (varies by district). These rebate programs can be a fantastic way to help homeowners pay for their landscape projects but there are some restrictions and eligibility requirements to consider before starting your project. NOTE: Rebate programs are normally given and annual budget and only available to residents while funds last. Requirements and rebate amounts will vary depending on water district. Rebate programs may be canceled at any time, so please check with your local water district. All below information was accurate at the time of article, but may have changed. Please check specifics for your particular municipality. The first and most important step is to visit www.socalwatersmart.com to familiarize yourself with the rebate process and to ensure your property and municipality is included in the turf removal rebate program. The website even includes an estimator to give you an idea how much you will receive in your rebate. In order to qualify for the program the proposed project area must include grass that will be removed. Your completed project must not include live turf or “turf looking plants” but should include water-smart plants. Synthetic turf projects are eligible for the rebate unless specified in your area. Some areas or municipalities may have further requirements for eligibility. That’s why it is important to visit the above website before starting your project. Each approved property is eligible for only one turf removal rebate. So if you plan on doing your project in stages, it is better to it all at once in order to maximize your rebate. Applying for the rebate is a two step process. It is important to follow these steps in order to qualify for and receive your rebate. It is important to remember that you must apply for and receive project start approval BEFORE beginning removal of any of your grass. Your rebate approval specifies a project square footage and reserves a rebate amount based on based on the measurements you provide on rebate application. You cannot add square footage of removal area to your rebate amount after you’ve been approved for a rebate so it is important to accurately measure and calculate your area before applying. To start the approval process, visit the SoCal Water Smart website and set up a log in account. Here you will find the application to fill out, which you will submit with five color photos of the removal area and a photo or copy of your most recent water bill. Once you complete and submit the application and necessary photos you will have to wait to receive an approval email before starting your project. This approval will arrive approximately two weeks after your application submission. Once you have received project approval you have 120 days to complete your project. Once you have completed your project within the 120 days, log in to your account on the SoCal Water Smart website to complete your rebate application. With your application you must submit five new color photos of your completed area and photo or copy of your most recent water bill. If your completed project includes synthetic turf you must also submit a photo or copy of your synthetic turf receipt. Once you submit your rebate application, you will receive an email with the results of your application review within four to five weeks. It is important to visit the website to familiarize yourself with the program requirements, application process, photo requirements, and all other aspects of the rebate process.